We produce only a few of these suits a year, made from start to finish by a single tailor who devotes 40 hours to each individual garment. The LASA model follows the shape of the body so closely that it seems sewn on. This is even more apparent in the sleeves, tapered at the forearms, making the jacket as soft as a shirt. As Ciro Paone says: “everyone dreams of the sea, but not all dream of the same sea”. Therefore, the first step is to invent a fabric for our clients that satisfies their innermost desires and which, like a mirror, is able to reflect their own personality. Kiton’s true exclusivity derives from our own woollen mill, Lanificio Carlo Barbera, where we create the fabrics from the raw materials. 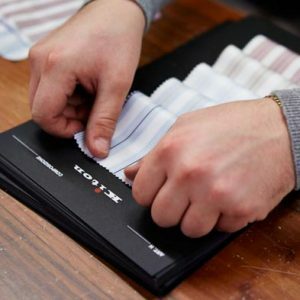 Here we select the rarest and most prestigious fibres which are then woven according to elaborate techniques, combining the appropriate colours to obtain the desired shades. 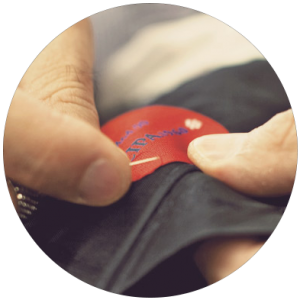 At this stage, the task is placed in the expert hands of the tailors, each dedicated to a single stage of garment production, considering both the style of the collection and the customer’s requirements, as always the key incentive of our business. 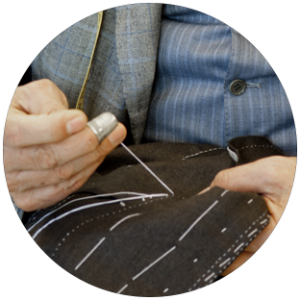 The suits are cut and basted by hand to meticulously enhance each detail; any other means would be inconceivable since the aim is to achieve the excellence. This is because machine stitching “locks up” the fabric and deprives it of air, movement and vitality preventing the garment from living in harmony with the wearer. We have been handling fabrics for seven generations. Ciro Paone started work in his uncle’s fabric warehouse at an early age. Over time, he accrued great knowledge and true passion for the fine fabrics, qualities that he has passed down to his heirs and associates. Still today everything goes around the quality of the fabrics, the main stimulus and the basis of the research and inspiration that represents our idea of style in every new season. For our garments we use natural fibres -the only ones able to create clothes of superior quality- and manual artisan techniques because, ultimately, they respect the delicacy and refinement of the high-quality fabrics. We have always worked with leading fabric producers, motivating research for new qualities of yarns to create the most exclusive fabrics in the world. The CIPA model is the newcomer, or rather it has been reinstated into the Kiton collections. Created in the sixties by Ciro Paone, it has recently been reintroduced into the current collections with a revised styling, with the aim of enhancing the ancient tradition of Neapolitan tailoring but adapting it to contemporary trends in international fashion. A new shape, a slimmer silhouette and exclusive fabrics designed specifically for Kiton that are inspired by the younger generations, who are fascinated by the elegance and sophistication of the Kiton style and who like to dress smartly. As always, the result is a unique style, deriving both from the design concept and the finishing stages; every detail is studied to guarantee the maximum exclusivity to the man which wear this special creation. 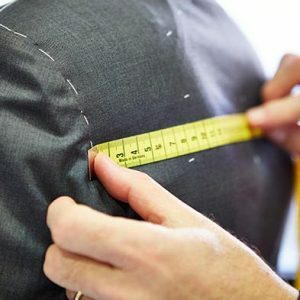 This suit model is created exclusively by five of our finest tailors, who follow its construction from start to finish, from the design concept to the definition of every single detail, devoting 50 hours of painstaking labour. Each of these tailors is able to produce a maximum of fifty K50 suits per year. The K50 model follows the line of the wearer’s body in a natural way because it is meticulously designed down to the finest detail; in particular at the points where the sleeve is attached to the body at the armhole, so as to always guarantee a perfect fit. This suit has a longer silhouette than the other Kiton models. This longer look is attained by sewing the shoulders at the same point where the collar meets the lapel, creating a very high gorge; this procedure makes the collar shorter and, therefore, more difficult to construct because it cannot hold either excessive weight or length at the same point.